When I was very young, I was captivated by dinosaur illustrations--one of my earliest artistic inspirations. 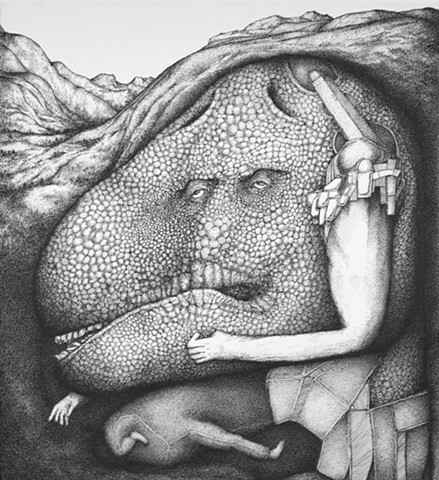 This piece captures some of the naive qualities of dinosaur illustration from the 1970s and 80s...anatomical inaccuracy paired with insane attention to imaginary detail, combined with a primeval eeriness. The extraneous details are like an uncertain dream creation, and I can at least say that it reflects uneasiness about technology. Anyone who says it is "Freudian" will receive a rebuke: I don't engage in such things.